Um… yeah… I’ve been watching a lot of hockey recently. Like everyone on the internet, my various bios conceal as much as they reveal. When someone asks about me, I’m prone to default to being funny rather than honest. I have no excuse for that, it’s just the way I am. We all develop strategies for dealing with these situations and mine is “Make the joke and move away”. So when I say “Yes” to questions like the one Laurence asked, it tends to surprise even people who know me in person. If you meet me, you might not even realize it. I’ve been developing ways to conceal these knee-jerk responses for over forty years. When I was younger it was ten times worse. It’s a wonder and a miracle that my wife and I ever met, much less talked to say nothing of married. One of the ways I get past my anxiety is by wearing a mask which you can see on beardless me in the snapshot at the top of the article. Yes, a literal mask. I realize that sounds a bit weird, but bear with me for a moment. Consider for a moment a man who is terrified of walking up and standing in front of a room full of people and talking. Then consider what it would take to make that happen. What kind of shield would it take for someone who shakes uncontrollably, and retreats to a fetal position when shut in a room with another person who isn’t even hostile, just actively neutral to stand up in front of a crowd and not only command their attention, but hold it? You would need Dumbo’s magic feather before you could fly that high. Unfortunately, you (usually) can’t just wander down the street in a mask without paying a higher social price than you are already paying for merely being shy. It is possible for the pendulum to swing too far in the other direction. What I really needed was a controlled environment for the experiment where this sort of behavior isn’t that strange. Luckily I was game to try anything and I know a lot of actors, who guided me to commedia dell’arte. 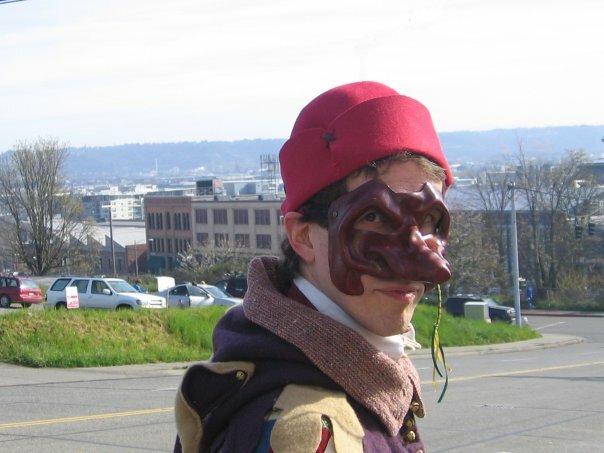 In case you’ve never taken a theater history class, commedia is a (mostly) Italian form of theater that arose during the renaissance, in which all the characters play specific archetypes, each with their own traditional mask. Masks are amazing. They’re not a panacea and may not work for everyone, but for me it was Dumbo’s feather. With that mask on, I could walk up to complete strangers and not only engage them in conversations, but I could stand on a stage, shouting at the top of my voice and attracting the sort of attention that without the mask would have me scrambling for cover. I became a lead character. I got paid to show up places. I was on the cover of the program, a terrified flying elephant holding onto a feather for all he’s worth. And like that feather, the mask was a trick. About eight years after I first put on the mask, I attended my first writer’s conference and for the first time I was one of the few people there actively meeting the eyes of those around me. Who was starting conversations with strangers, walking up to tables at the dinners and introducing myself, leading conversations, holding up my hand in classrooms. I met my friends Gabby and Andrea. Outside the agents and editors room instead of staring intently at my shoes or rocking back and forth, I pictured myself putting on my mask. I walked in with my back straight and met the eye of the people I talked to. I was still shaking when I walked out, but my voice was as steady as my handshake and my eye contact was good. I don’t like binary terms as a rule because in practice most of these psychological dichotomies fall apart quickly. In reality, most humans are not purely introverts or purely extroverts; we exist somewhere on a continuum depending on our surroundings and companions. We all have preferences and inclinations, but that’s not the same thing. Anxiety can make you more introverted (as it did me for years) or it can have the opposite effect because you’re covering or channeling the energy into manic behavior like Robin Williams. (Or somewhere between those two extremes, lest I too commit to an unfortunate and false dichotomy). The ‘shy homebody writer’ is a stereotype that gets tiresome, but that doesn’t mean it’s not entirely rooted in truth. I mean, sure, John Scalzi exists, but I don’t think it’s that ‘out there’ to admit that the rest of us would rather be at home playing with our imaginary friends. Given my druthers, I would still hide in my corner and write my stories without ever doing anything else. Instead, I’m presenting ideas to the boards of local charities and nonprofits. I’m heading up committees designated with the task of broadcasting the missions of those organizations to a larger audience. I’m walking up to editors and agents and journalists (in person) and felt slightly less like I’m skating on thin ice over the dark waters of panic. I knew I’d work hockey into this somehow. Writing is no longer a ‘hide and send out missives to the masses’ activity. We have to mingle. We have to commit to social media presences. Sometimes we’re contractually obligated to do so. For better or worse, this is the stage I found myself on, and though I’ve long ago hung the leather mask on the wall I carry on with an imaginary one. Because if I want to introduce all of you to those imaginary friends of mine, it’s what I have to do.